Tom Bergeron won’t be getting any more rest next season. America’s Funniest Home Videos has just been renewed for season 23 by ABC. Bergeron hosts the venerable home movie show, in addition to already-renewed Dancing with the Stars. America’s Funniest Home Videos began in 1989 with Bob Saget as host. He continued until 1997 and John Fugelsang & Daisy Fuentes took over briefly. 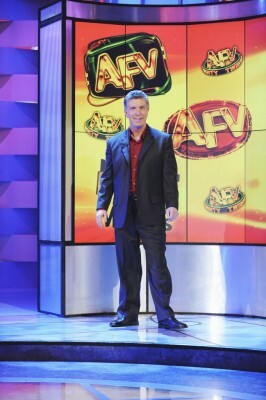 Bergeron started in 2001, is AFV’s longest-serving host and has led more than 200 installments. AFV has lost some ratings steam this season, averaging a 1.6 rating in the 18-49 demographic with 6.64 million total viewers. It’s ABC’s ninth highest-rated non-scripted show out of 13. Still, one would guess that it’s the network’s cheapest show to produce. ABC will announce their 2012-13 season schedule next week so we’ll know if the network plans to shift AFV to another night (as they did with Extreme Makeover: Home Edition) or keep it on Sundays. What do you think? Are you an AFV fan? Does ABC still need to produce new episodes or could they just re-run old ones? More about: America's Funniest Home Videos, America's Funniest Home Videos: canceled or renewed? but I think they should keep going!!!!! something weird is that they STILL have their “send your videos to afv!” commercial thing, so they haven’t stopped yet!! All of the episodes through the end of November are new. They’ve interspersed previously used clips in new shows for years though. I have enjoyed AFHV for the whole time it has been on the air! My husband and I just love it! We laugh so much and enjoy the family friendly contents,. We also love the humor of Tom Bergeron very much! I ask you to please keep this great show in production for years to come ! Thank you! Great family time. We watch AFV as a family ( kids 9, 6, 4) every week with popcorn and snacks and we laugh together for an hour. What could be better than that! We love AFV! I don’t see anything funny about this show or the videos on it. How has it stayed on so long? It must be a purely profitable reason.